Draft: 1998, New York Mets, 14th rd. November 17, 2015 SS Gil Velazquez assigned to Naranjeros de Hermosillo. November 17, 2015 Naranjeros de Hermosillo activated SS Gil Velazquez. November 7, 2015 Aguilas de Mexicali placed SS Gil Velazquez on the reserve list. February 17, 2015 Leones de Yucatan released SS Gil Velazquez. February 6, 2015 Leones de Yucatan placed SS Gil Velazquez on the reserve list. October 7, 2014 SS Gil Velazquez assigned to Aguilas de Mexicali. April 8, 2014 SS Gil Velazquez assigned to Leones de Yucatan. January 30, 2014 SS Gil Velazquez assigned to Mexico. October 10, 2013 3B Gil Velazquez elected free agency. October 4, 2013 Miami Marlins sent SS Gil Velazquez outright to New Orleans Zephyrs. September 30, 2013 Miami Marlins recalled Gil Velazquez from New Orleans Zephyrs. August 26, 2013 Miami Marlins optioned Gil Velazquez to New Orleans Zephyrs. August 19, 2013 Miami Marlins selected the contract of Gil Velazquez from New Orleans Zephyrs. June 15, 2013 Gil Velazquez roster status changed by New Orleans Zephyrs. June 7, 2013 New Orleans Zephyrs placed SS Gil Velazquez on the 7-day disabled list. May 18, 2013 3B Gil Velazquez assigned to New Orleans Zephyrs. May 11, 2013 Scranton/Wilkes-Barre RailRiders released 3B Gil Velazquez. December 24, 2012 New York Yankees signed free agent 2B Gil Velazquez to a minor league contract and invited him to spring training. November 11, 2012 Aguilas de Mexicali activated SS Gil Velazquez. October 22, 2012 3B Gil Velazquez elected free agency. October 17, 2012 Miami Marlins sent Gil Velazquez outright to New Orleans Zephyrs. October 13, 2012 2B Gil Velazquez assigned to Aguilas de Mexicali. September 14, 2012 Miami Marlins selected the contract of Gil Velazquez from New Orleans Zephyrs. August 21, 2012 Miami Marlins sent Gil Velazquez outright to New Orleans Zephyrs. August 19, 2012 Miami Marlins designated Gil Velazquez for assignment. August 16, 2012 Miami Marlins selected the contract of 3B Gil Velazquez from New Orleans Zephyrs. June 30, 2012 Gil Velazquez roster status changed by New Orleans Zephyrs. June 27, 2012 SS Gil Velazquez suspended. April 3, 2012 SS Gil Velazquez assigned to New Orleans Zephyrs. December 30, 2011 Miami Marlins signed free agent 3B Gil Velazquez to a minor league contract and invited him to spring training. November 2, 2011 SS Gil Velazquez elected free agency. October 28, 2011 Los Angeles Angels sent SS Gil Velazquez outright to Salt Lake Bees. 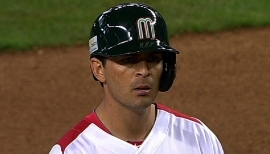 October 10, 2011 SS Gil Velazquez assigned to Aguilas de Mexicali. September 6, 2011 Los Angeles Angels selected the contract of Gil Velazquez from Salt Lake Bees. April 6, 2011 Gil Velazquez assigned to Salt Lake Bees from Los Angeles Angels. January 28, 2011 Los Angeles Angels signed free agent SS Gil Velazquez to a minor league contract and invited him to spring training. November 6, 2010 SS Gil Velazquez elected free agency. May 21, 2010 Pawtucket Red Sox activated SS Gil Velazquez from the 7-day disabled list. April 7, 2010 SS Gil Velazquez assigned to Pawtucket Red Sox from Boston Red Sox. January 15, 2010 Boston Red Sox signed free agent SS Gil Velazquez to a minor league contract and invited him to spring training. October 13, 2009 SS Gil Velazquez elected free agency. August 10, 2009 SS Gil Velazquez assigned to Pawtucket Red Sox. August 5, 2009 Pawtucket Red Sox designated SS Gil Velazquez for assignment. August 5, 2009 Boston Red Sox designated SS Gil Velazquez for assignment. May 20, 2009 Boston Red Sox optioned SS Gil Velazquez to Pawtucket Red Sox. May 12, 2009 Boston Red Sox recalled Gil Velazquez from Pawtucket Red Sox. April 26, 2009 Boston Red Sox optioned Gil Velazquez to Pawtucket Red Sox. April 13, 2009 Boston Red Sox purchased Gil Velazquez from Pawtucket Red Sox. April 7, 2005 SS Gil Velazquez assigned to New Britain Rock Cats.